"Ecclesiastical year" redirects here. For the Jewish ecclesiastical new year, see Hebrew calendar § New year. For Dom Guéranger's series of books, see The Liturgical Year. "Christian year" redirects here. For John Keble's series of poems, see The Christian Year. Distinct liturgical colours may appear in connection with different seasons of the liturgical year. The dates of the festivals vary somewhat between the different churches, though the sequence and logic is largely the same. The liturgical year of some western churches other than the Catholic Church, indicating the liturgical colours. The liturgical cycle divides the year into a series of seasons, each with their own mood, theological emphases, and modes of prayer, which can be signified by different ways of decorating churches, colours of paraments and vestments for clergy, scriptural readings, themes for preaching and even different traditions and practices often observed personally or in the home. In churches that follow the liturgical year, the scripture passages for each Sunday (and even each day of the year in some traditions) are specified in a lectionary. After the Protestant Reformation, Anglicans and Lutherans continued to follow the lectionary of the Roman Rite. Following a decision of the Second Vatican Council, the Catholic Church revised that lectionary in 1969, adopting a three-year cycle of readings for Sundays and a two-year cycle for weekdays. Adaptations of the revised Roman Rite lectionary were adopted by Protestants, leading to the publication in 1994 of the Revised Common Lectionary for Sundays and major feasts, which is now used by many Protestant denominations, including also Methodists, Reformed, United, etc. This has led to a greater awareness of the traditional Christian year among Protestants, especially among mainline denominations. Scholars are not in agreement about whether the calendars used by the Jews before the Babylonian exile were solar (based on the return of the same relative position between the sun and the earth), lunisolar (based on months that corresponded to the cycle of the moon, with periodic additional months to bring the calendar back into agreement with the solar cycle) like the present-day Jewish calendar of Hillel II, or purely lunar, as the Hijri calendar. The first month of the Hebrew year was called אביב (Aviv), evidently adopted by Moses from Ipip as the eleventh month of the non-lunar Egyptian calendar (that is also the origin of Abib as the tenth month of the non-lunar Ethiopian calendar), meaning the month of green ears of grain. Having to occur at the appropriate time in the spring, it thus was originally part of a tropical calendar. At about the time of the Babylonian exile, when using the Babylonian civil calendar, the Jews adopted as the name for the month the term ניסן (Nisan), based on the Babylonian name Nisanu. Thomas J Talley says that the adoption of the Babylonian term occurred even before the exile. The liturgical seasons of East Syriac Catholic churches. The biblical reading and prayers during Mass and Liturgy of the Hours varies according to different seasons in liturgical calendar. The various seasons of the liturgical calendar of Syro Malabar Church and Chaldean Catholic Church are given below. Weeks of Annunciation (Subara) is the first season of the liturgical year. The liturgical year begins with the proclamation and celebration of the historical encounter between God and man in the person of Jesus Christ, the human appearance of the Divine Person. The Syriac word Subara, 'Annunciation', with which the Church qualify the first five or six weeks of her liturgical year, is, in fact, an announcement and proclamation with celebration with this supreme glad news of divine condescension to the human frailty in order to raise it up to the divine sublimity. The season begins on the Sunday just before the first of December and ends with the feast of Epiphany that is the Feast of the Baptism of the Lord. This season is developed in the context of the mystery of incarnation completed in the fullness of time. The Church recalls during these days the announcement of the birth of John the Baptist, the predecessor of Jesus, and also the joyful event of the birth of John the Baptist. As a preparation for the celebration of the mystery of incarnation, this season also recalls creation, the disobedience of our first parents and its consequences, the miserable state of the broken humanity, the promise of salvation offered by God, God's covenant with humanity, and the prophecies about the Saviour. During this season the church also meditates on the role of Mary in the history of the plan of salvation. The whole importance of Mary, and hence her veneration in the Church, depends on her relation to Jesus, the most special being His mother. Her celebration is also underlined with two very solemn festivals of her: Immaculate Conception on December 8 and Congratulation to Mary as Mother of Jesus on the last Friday of this season. The Church practices abstinence during December 1–25 in preparation for Christmas; this period is called "25 days Lent". Weeks of Epiphany begins on the Sunday closer to the feast of Epiphany and runs to the beginning of Great Fast. The word Denha in Syriac means sunrise. During the period the faithful meditate on the manifestation of Holy Trinity and revelation of Christ the light of the world. Baptism in Jordan was the first historical event when the Holy Trinity is revealed to humans in the humanity of Jesus Christ. During the season the church celebrate the feasts of Saints in connection with the manifestation of the Lord. During these weeks the faithful reflect on and meditate over the public life of Jesus and especially on its culmination in his passion, death and burial. The season begins 50 days before Easter on Peturta Sunday and comprises whole period of Great Lent and culminates on Resurrection Sunday. Word Peturta in Syriac means "looking back" or "reconciliation". It is a God-given time for turning to one's own life more deeply and to become convinced of the abundant blessings of the loving God – the creation, the providential caring, the human fall, the helplessness of man to save himself, the promise of salvation, the redemption through His Son Jesus and the Passion of the Christ. Faithful enter the weeks of Great Fast, celebrating the memory of all the Faithful Departed on the last Friday of Denha. According to the ecclesial and liturgical vision of this tradition, the weeks of Great Fast is also an occasion to keep up the memory of the beloved Departed through special prayers, renunciation, almsgiving, and so on and thus prepare oneself for a good death and resurrection in Jesus Christ. During the fast faithful of Syro Malabar Church do not use meat, fish, egg, many dairy products, and most favorite food items, and also avoid sexual contacts on all days including Sundays and Feast days. Before European colonisation, Indian Nasranis used to take food only once a day (after 3:00 pm) on all days during Great Fast. The weeks of Great Resurrection begin on the Resurrection Sunday and run to the feast of Pentecost. The Church celebrates the Resurrection of our Lord during these seven weeks: Jesus’ victory over death, sin, suffering and Satan. It is the Season to exult in the new life obtained through the Resurrection of the Saviour. The church also commemorates various events that occurred after the resurrection of Christ, such as the visits of Jesus to Apostles and the ascension of Jesus. According to eastern Christianity, the Feast of Resurrection is the most important and the greatest feast in a liturgical year. Therefore, the season commemorating resurrection of Christ is also of prime importance in the church liturgy. The first week of the season is celebrated as the 'Week of weeks' as it is the week of resurrection of Christ. Weeks of apostles (Slihe) starts on the feast of Pentecost, fiftieth day of the Resurrection Sunday. During these days the church commemorates the inauguration of church and the acts of apostles and church fathers, through which the foundation of church wa laid. Church meditates on the virtues of early church: fellowship, breaking of bread and sharing of wealth and the fruits and gifts of Holy Spirit. The spread of the church all over the world as well as her growth is also remembered during this season. Feast of Friday of Gold: The first commemoration of first miracle of apostles done by Saint Peter. The liturgical year in the Eastern Orthodox Church is characterized by alternating fasts and feasts, and is in many ways similar to the Roman Catholic year. However, Church New Year (Indiction) traditionally begins on September 1 (Old Style or New Style), rather than the first Sunday of Advent. It includes both feasts on the Fixed Cycle and the Paschal Cycle (or Moveable Cycle). The most important feast day by far is the Feast of Pascha (Easter) – the Feast of Feasts. Then the Twelve Great Feasts, which commemorate various significant events in the lives of Jesus Christ and of the Theotokos (Virgin Mary). The majority of Orthodox Christians (Russians, in particular) follow the Julian Calendar in calculating their ecclesiastical feasts, but many (including the Ecumenical Patriarchate and the Church of Greece), while preserving the Julian calculation for feasts on the Paschal Cycle, have adopted the Revised Julian Calendar (at present coinciding with the Gregorian Calendar) to calculate those feasts which are fixed according to the calendar date. Between 1900 and 2100, there is a thirteen-day difference between the dates of the Julian and the Revised Julian and Gregorian calendars. Thus, for example, where Christmas is celebrated on December 25 O.S. (Old Style), the celebration coincides with January 7 in the Revised Calendar. The computation of the day of Pascha (Easter) is, however, always computed according to a lunar calendar based on the Julian Calendar, even by those churches which observe the Revised Calendar. There are four fasting seasons during the year: The most important fast is Great Lent which is an intense time of fasting, almsgiving and prayer, extending for forty days prior to Palm Sunday and Holy Week, as a preparation for Pascha. The Nativity Fast (Winter Lent) is a time of preparation for the Feast of the Nativity of Christ (Christmas), but whereas Advent in the West lasts only four weeks, Nativity Fast lasts a full forty days. The Apostles' Fast is variable in length, lasting anywhere from eight days to six weeks, in preparation for the Feast of Saints Peter and Paul (June 29). The Dormition Fast lasts for two weeks from August 1 to August 14 in preparation for the Feast of the Dormition of the Theotokos (August 15). The liturgical year is so constructed that during each of these fasting seasons, one of the Great Feasts occurs, so that fasting may be tempered with joy. In addition to these fasting seasons, Orthodox Christians fast on Wednesdays and Fridays throughout the year (and some Orthodox monasteries also observe Monday as a fast day). Certain fixed days are always fast days, even if they fall on a Saturday or Sunday (in which case the fast is lessened somewhat, but not abrogated altogether); these are: The Decollation of St. John the Baptist, the Exaltation of the Cross and the day before the Epiphany (January 5). There are several fast-free periods, when it is forbidden to fast, even on Wednesday and Friday. These are: the week following Pascha, the week following Pentecost, the period from the Nativity of Christ until January the 5th and the first week of the Triodion (the week following the 17th Sunday before Pentecost). The greatest feast is Pascha. Easter for both East and West is calculated as the first Sunday after the full moon that falls on or after March 21 (nominally the day of the vernal equinox), but the Orthodox calculations are based on the Julian calendar, whose March 21 corresponds at present with April 3 of the Gregorian calendar, and on calculations of the date of full moon different from those used in the West (see computus for further details). The date of Pascha is central to the entire ecclesiastical year, determining not only the date for the beginning of Great Lent and Pentecost, but affecting the cycle of moveable feasts, of scriptural readings and the Octoechos (texts chanted according to the eight ecclesiastical modes) throughout the year. There are also a number of lesser feasts throughout the year that are based upon the date of Pascha. The moveable cycle begins on the Zacchaeus Sunday (the first Sunday in preparation for Great Lent or the 33rd Sunday after Pentecost as it is known), though the cycle of the Octoechos continues until Palm Sunday. Some of these feasts follow the Fixed Cycle, and some follow the Moveable (Paschal) Cycle. Most of those on the Fixed Cycle have a period of preparation called a Forefeast, and a period of celebration afterward, similar to the Western Octave, called an Afterfeast. Great Feasts on the Paschal Cycle do not have Forefeasts. The lengths of Forefeasts and Afterfeasts vary, according to the feast. Christ's presentation as an infant in the Temple by the Theotokos and Joseph. Note: In Eastern practice, should this feast fall during Holy Week or on Pascha itself, the feast of the Annunciation is not transferred to another day. In fact, the conjunction of the feasts of the Annunciation and Pascha (known as διπλή Πασχαλιά, dipli Paschalia in Modern Greek) is considered an extremely festive event. known in the West as Palm Sunday. Christ's ascension into Heaven following his resurrection. The Holy Spirit comes and indwells the apostles and other Christian believers. Christ's Transfiguration as witnessed by Peter, James and John. Every day throughout the year commemorates some saint or some event in the lives of Christ or the Theotokos. When a feast on the moveable cycle occurs, the feast on the fixed cycle that was set for that calendar day is transferred, with the propers of the feast often being chanted at Compline on the nearest convenient day. In addition to the Fixed and Moveable Cycles, there are a number of other liturgical cycles in the ecclesiastical year that affect the celebration of the divine services. These include, the Daily Cycle, the Weekly Cycle, the Cycle of Matins Gospels, and the Octoechos. The month of October from a liturgical calendar for Abbotsbury Abbey. 13th-century manuscript (British Library, Cotton MS Cleopatra B IX, folio 59r). Western Christian liturgical calendars are based on the cycle of the Roman Rite of the Catholic Church, including Lutheran, Anglican, and other Protestant calendars since this cycle pre-dates the Reformation. Generally, the liturgical seasons in western Christianity are Advent, Christmas, Ordinary Time (Time after Epiphany), Lent, Easter, and Ordinary Time (Time after Pentecost). Some Protestant traditions do not include Ordinary Time: every day falls into a denominated season. All these calendars agree that the Lord's Day is of primary importance among the observances of the year and that the Christian Year contains two central cycles – the Easter cycle and the Christmas cycle. Each cycle includes a festival season (Easter and Christmas), preceded by a season of preparation and anticipation (Lent and Advent). In most denominational versions and in the Common Lectionary, Lent and Advent are immediately preceded by a transitional Sunday (Transfiguration and Christ the King), and the Easter and Christmas Seasons are immediately followed by a transitional Sunday (Trinity and Baptism of the Lord). Protestant Churches, with exception of the Lutheran and Anglican, generally observe fewer feasts with regard to the saints, than the aforementioned liturgical denominations, in addition to the Roman Catholic and Orthodox Churches. The Roman Catholic Church sets aside certain days and seasons of each year to recall and celebrate various events in the life of Christ. In its Roman Rite the liturgical year begins with Advent, the time of preparation for both the celebration of Jesus' birth, and his expected second coming at the end of time. This season lasts until Christmas Eve on December 24. Christmastide follows, beginning with First Vespers of Christmas on the evening of December 24 and ending with the Feast of the Baptism of the Lord. Traditionally, the end of Christmastide was February 2, or the Feast of the Presentation of the Lord, also known as Candlemas. This feast recounts the 40 days of rest Mary took before being purified and presenting her first-born son to the Temple in Jerusalem. Lent is the period of purification and penance that begins on Ash Wednesday and ends on Holy Thursday. The Holy Thursday evening Mass of the Lord's Supper marks the beginning of the Easter Triduum, which includes Good Friday, Holy Saturday, and Easter Sunday. The days of the Easter Triduum recall Jesus' Last Supper with his disciples, death on the cross, burial, and resurrection. The seven-week liturgical season of Easter immediately follows the Triduum, climaxing at Pentecost. This last feast recalls the descent of the Holy Spirit upon Jesus' disciples after the Ascension of Jesus. 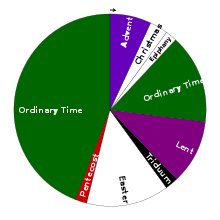 The rest of the liturgical year is commonly known as Ordinary Time. There are many forms of liturgy in the Catholic Church. Even putting aside the many Eastern rites in use, the Latin liturgical rites alone include the Ambrosian Rite, the Mozarabic Rite, and the Cistercian Rite, as well as other forms that have been largely abandoned in favour of adopting the Roman Rite. Of this rite, what is now the "ordinary" or, to use a word employed in the Letter of Pope Benedict XVI accompanying the motu proprio Summorum Pontificum, the "normal" form is that which developed from the Second Vatican Council to the present day, while the form in force in 1962 is authorized as an extraordinary form of the Roman Rite without restriction in private celebrations, and under the conditions indicated in article 5 of the motu proprio Summorum Pontificum in public celebrations. The liturgical calendar in that form of the Roman Rite (see General Roman Calendar of 1960) differs in some respects from that of the present ordinary form, as will be noted below, and also from the earlier General Roman Calendar of Pope Pius XII, the still earlier General Roman Calendar of 1954 and the original Tridentine Calendar. These articles can be consulted with regard to the Roman-Rite liturgical year before 1960. The Church of England, Mother Church of the Anglican Communion, uses a liturgical year that is in most respects identical to that of the 1969 Roman Catholic Common Lectionary. While the calendars contained within the Book of Common Prayer and the Alternative Service Book (1980) have no "Ordinary Time", Common Worship (2000) adopted the ecumenical 1983 Revised Common Lectionary. The few exceptions are Sundays following Christmas and Transfiguration, observed on the last Sunday before Lent instead of on Reminiscere. In some Anglican traditions (including the Church of England) the Christmas season is followed by an Epiphany season, which begins on the Eve of the Epiphany (on 6 January or the nearest Sunday) and ends on the Feast of the Presentation (on February 2 or the nearest Sunday). Ordinary Time then begins after this period. The Book of Common Prayer contains within it the traditional Western Eucharistic lectionary which traces its roots to the Comes of St. Jerome in the 5th century. Its similarity to the ancient lectionary is particularly obvious during Trinity season (Sundays after the Sunday after Pentecost), reflecting that understanding of sanctification. Reformed Christians emphasize weekly celebration of the Lord's day and, while some of them celebrate also what they call the five evangelical feasts, others celebrate no holy days. Advent (from the Latin word adventus, which means "arrival" or "coming") is the first season of the liturgical year. It begins four Sundays before Christmas, the Sunday falling on or nearest to November 30, and ends on Christmas Eve. Traditionally observed as a "fast", it focuses on preparation for the coming of Christ, not only the coming of the Christ-child at Christmas, but also, in the first weeks, on the eschatological final coming of Christ, making Advent "a period for devout and joyful expectation". This season is often marked by the Advent Wreath, a garland of evergreens with four candles. Although the main symbolism of the advent wreath is simply marking the progression of time, many churches attach themes to each candle, most often 'hope', 'faith', 'joy', and 'love'. Other popular devotions during Advent include the use of the Advent Calendar or the Tree of Jesse to count down the days to Christmas. Liturgical colour: violet or purple; blue in some traditions, such as Methodist, Episcopalian, and Lutheran. A white coloured parament hangs from the pulpit, indicating that the current liturgical season is Christmastide. The fact that the Christ Candle in the centre of the Advent wreath is lit also indicates that Christmas has arrived. The Christmas season immediately follows Advent. The traditional Twelve Days of Christmas begin with Christmas Eve on the evening of December 24 and continue until the feast of Epiphany. The actual Christmas season continues until the Feast of the Baptism of Christ, which in the present form of the Roman Rite is celebrated on the Sunday after January 6, or the following Monday if that Sunday is Epiphany. In the pre-1970 form, this feast is celebrated on January 13, unless January 13 is a Sunday, in which case the feast of the Holy Family is celebrated instead. Until the suppression of the Octave of the Epiphany in the 1960 reforms, January 13 was the Octave day of the Epiphany, providing the date for the end of the season. Traditionally, the end of Christmastide was February 2, or the Feast of the Presentation of the Lord, also known as Candlemas. This feast recounts the 40 days of rest Mary took before being purified and presenting her first-born son to the Temple in Jerusalem. In medieval times, Candlemas eve (Feb. 1st) marked the day when all Christmas decorations, including the Christmas tree and the Nativity scene, were taken down. However, the tradition of ending Christmastide on Candlemas has slowly waned, except in some pockets of the Hispanic world where Candlemas (or La Fiesta de la Candelaria) is still an important feast and the unofficial end of the Christmas season. "Ordinary" comes from the same root as our word "ordinal", and in this sense means "the counted weeks". In the Roman Catholic Church and in some Protestant traditions, these are the common weeks which do not belong to a proper season. In Latin, these seasons are called the weeks per annum, or "through the year". In the current form of the Roman Rite adopted following the Second Vatican Council, Ordinary Time consists of 33 or 34 Sundays and is divided into two sections. The first portion extends from the day following the Feast of the Baptism of Christ until the day before Ash Wednesday (the beginning of Lent). It contains anywhere from three to eight Sundays, depending on how early or late Easter falls. The main focus in the readings of the Mass is Christ's earthly ministry, rather than any one particular event. The counting of the Sundays resumes following Eastertide; however, two Sundays are replaced by Pentecost and Trinity Sunday, and depending on whether the year has 52 or 53 weeks, one may be omitted. In the pre-1970 form of the Roman Rite, the Time after Epiphany has anywhere from one to six Sundays. As in the current form of the rite, the season mainly concerns Christ's preaching and ministry, with many of his parables read as the Gospel readings. The season begins on January 14 and ends on the Saturday before Septuagesima Sunday. Omitted Sundays after Epiphany are transferred to Time after Pentecost and celebrated between the Twenty-Third and the Last Sunday after Pentecost according to an order indicated in the Code of Rubrics, 18, with complete omission of any for which there is no Sunday available in the current year. Before the 1960 revisions, the omitted Sunday would be celebrated on the Saturday before Septuagesima Sunday, or, in the case of the Twenty-Third Sunday after Pentecost, on the Saturday before the Last Sunday after Pentecost. Septuagesima (from the Latin word for "seventieth") is a two-and-a-half-week period before Lent. This pre-Lent season is present in the pre-1970 form of the Roman Rite and in some Protestant calendars. It is a transition from the first part of the season per annum to the season of Lent, and a preparation for the fasting and penance which begin on Ash Wednesday. Although most of the Divine Office remains the same as during the season per annum, certain customs of Lent are adopted, including the suppression of the "Alleluia", the replacement of the Alleluia at Mass with the Tract and the Gloria is no longer said on Sundays. In the 1969 reform of the Roman Rite, this intermediate season was removed, with these weeks becoming part of Ordinary Time. Lent is a major penitential season of preparation for Easter. It begins on Ash Wednesday and, if the penitential days of Good Friday and Holy Saturday are included, lasts for forty days, since the six Sundays within the season are not counted. In the Roman Rite, the Gloria in Excelsis Deo and the Te Deum are not used in the Mass and Liturgy of the Hours respectively, except on Solemnities and Feasts, and the Alleluia and verse that usually precede the reading of the Gospel is either omitted or replaced with another acclamation. Lutheran churches make these same omissions. As in Advent, the deacon and subdeacon of the pre-1970 form of the Roman Rite do not wear their habitual dalmatic and tunicle (signs of joy) in Masses of the season during Lent; instead they wear "folded chasubles", in accordance with the ancient custom. In the pre-1970 form of the Roman Rite, the two weeks before Easter form the season of Passiontide, a subsection of the Lenten season that begins with Matins of Ash Wednesday and ends immediately before the Mass of the Easter Vigil. In this form, what used to be officially called Passion Sunday, has the official name of the First Sunday in Passiontide, and Palm Sunday has the additional name of the Second Sunday in Passiontide. In Sunday and ferial Masses (but not on feasts celebrated in the first of these two weeks) the Gloria Patri is omitted at the Entrance Antiphon and at the Lavabo, as well as in the responds in the Divine Office. In the post-1969 form of the Roman Rite, "Passion Sunday" and "Palm Sunday" are both names for the Sunday before Easter, officially called "Palm Sunday of the Lord's Passion". The former Passion Sunday became a fifth Sunday of Lent. The earlier form reads Matthew's account on Sunday, Mark's on Tuesday, and Luke's on Wednesday, while the post-1969 form reads the Passion only on Palm Sunday (with the three Synoptic Gospels arranged in a three-year cycle) and on Good Friday, when it reads the Passion according to John, as also do earlier forms of the Roman Rite. The veiling of crucifixes and images of the saints with violet cloth, which was obligatory before 1970, is left to the decision of the national bishops' conferences. In the United States, it is permitted but not required, at the discretion of the pastor. In all forms, the readings concern the events leading up to the Last Supper and the betrayal, Passion, and death of Christ. The week before Easter is called Holy Week. In the Roman Rite, feasts that fall within that week are simply omitted, unless they have the rank of Solemnity, in which case they are transferred to another date. The only solemnities inscribed in the General Calendar that can fall within that week are those of St. Joseph and the Annunciation. Liturgical colour: violet or purple. The colour rose may be used, where it is the practice, on Laetare Sunday (4th Sunday of Lent). On Palm Sunday the colour since 1970 is red, by earlier rules violet or purple, with red being used after 1955 for the blessing of the palms. The Easter Triduum consists of Good Friday, Holy Saturday and Easter Sunday. Each of these days begins liturgically not with the morning but with the preceding evening. The triduum begins on the evening before Good Friday with Mass of the Lord's Supper, celebrated with white vestments, and often includes a ritual of ceremonial footwashing. It is customary on this night for a vigil involving private prayer to take place, beginning after the evening service and continuing until midnight. This vigil is occasionally renewed at dawn, continuing until the Good Friday liturgy. During the day of Good Friday Mass is not celebrated in the Roman Catholic Church. Instead a Celebration of the Passion of the Lord is held in the afternoon or evening. It consists of three parts: a Liturgy of the Word that includes the reading of the account of the Passion by John the Evangelist and concludes with a solemn Universal Prayer. Other churches also have their Good Friday commemoration of the Passion. The colour of vestments varies: no colour, red, or black are used in different traditions. Coloured hangings may be removed. Lutheran churches often either remove colourful adornments and icons, or veil them with drab cloth. The service is usually plain with somber music, ending with the congregation leaving in silence. In the Roman Catholic, some Lutheran, and High Anglican rites, a crucifix (not necessarily the one which stands on or near the altar on other days of the year) is ceremoniously unveiled. Other crucifixes are unveiled, without ceremony, after the service. Holy Saturday commemorates the day during which Christ lay in the tomb. In the Roman Catholic Church, there is no Mass on this day; the Easter Vigil Mass, which, though celebrated properly at the following midnight, is often celebrated in the evening, is an Easter Mass. With no liturgical celebration, there is no question of a liturgical colour. The Easter Vigil is held in the night between Holy Saturday and Easter Sunday, to celebrate the resurrection of Jesus. See also Paschal candle. The liturgical colour is white, often together with gold. In the Roman Rite, during the "Gloria in Excelsis Deo" the organ and bells are used in the liturgy for the first time in 2 days, and the statues, which have been veiled during Passiontide (at least in the Roman Rite through the 1962 version), are unveiled. In Lutheran churches, colours and icons are re-displayed as well. Easter is the celebration of Jesus' Resurrection. The date of Easter varies from year to year, according to a lunar-calendar dating system (see computus for details). In the Roman Rite, the Easter season extends from the Easter Vigil through Pentecost Sunday. In the pre-1970 form of the rite, this season includes also the Octave of Pentecost, so Eastertide lasts until None of the following Saturday. In the Roman Rite, the Easter octave allows no other feasts to be celebrated or commemorated during it; a solemnity, such as the Annunciation, falling within it is transferred to the following Monday. If Easter Sunday or Easter Monday falls on 25 April, the Greater Litanies, which in the pre-1970 form of the Roman Rite are on that day, are transferred to the following Tuesday. By a decree of May 5, 2000, the Second Sunday of Easter (the Sunday after Easter Day itself), is known also in the Roman Rite as the Feast of the Divine Mercy. Ascension Thursday, which celebrates the return of Jesus to heaven following his resurrection, is the fortieth day of Easter, but, in places where it is not observed as a Holy Day of Obligation, the post-1969 form of the Roman rite transfers it to the following Sunday. Pentecost is the fiftieth and last day of the Easter season. It celebrates the sending of the Holy Spirit to the Apostles, which traditionally marks the birth of the Church, see also Apostolic Age. Liturgical colour: white, but red on the feast of Pentecost. This season, under various names, follows the Easter season and the feasts of Easter, Ascension, and Pentecost. In the post-1969 form of the Roman rite, Ordinary Time resumes on Pentecost Monday, omitting the Sunday which would have fallen on Pentecost. In the earlier form, where Pentecost is celebrated with an octave, the Time after Pentecost begins at Vespers on the Saturday after Pentecost. The Sundays resume their numbering at the point that will make the Sunday before Advent the thirty-fourth, omitting any weeks for which there is no room (present-day form of the Roman Rite) or are numbered as "Sundays after Pentecost" (pre-1970 Roman Rite, Eastern Orthodoxy and some Protestants) or as "Sundays after Trinity" (some Protestants). This season ends on the Saturday before the First Sunday of Advent. Trinity Sunday, the first Sunday after Pentecost. Corpus Christi (Roman Rite and some Anglican and Lutheran traditions), Thursday of the second week after Pentecost, often celebrated on the following Sunday. Solemnity of the Sacred Heart of Jesus (Roman Rite), Friday in the third week after Pentecost. World Day of the Poor, 33rd Sunday of Ordinary Time. Feast of Christ the King, last Sunday before Advent (Roman Rite, Lutherans, Anglicans) or last Sunday in October (1925–1969 form of the Roman Rite). In the final few weeks of Ordinary Time, many churches direct attention to the coming of the Kingdom of God, thus ending the liturgical year with an eschatological theme that is one of the predominant themes of the season of Advent that began the liturgical year. For instance, in the pre-1970 form of the Roman Rite, the Gospel of the Last Sunday is Matthew 24:15–35 and in the later form of that rite all the last three Sundays have similar themes. While the Roman Rite adopts no special designation for this final part of Ordinary Time, some denominations do, and may also change the liturgical colour. The Church of England uses the term "Sundays before Advent" for the final four Sundays and permits red vestments as an alternative. Other denominations, including the United Methodist Church and the Christian Church - Synod of Saint Timothy, speak of "Kingdomtide". The Lutheran Church–Missouri Synod (LCMS) uses the terms "Third-Last, Second-Last and Last Sunday in the Church Year" and does not change from green. The LCMS does not officially celebrate a "Feast of Christ the King." The Wisconsin Evangelical Lutheran Synod (WELS) uses the term "Period of End Times" and assigns red vestments to the first and second Sundays. In some Protestant traditions, especially those with closer ties to the Lutheran tradition, Reformation Sunday is celebrated on the Sunday preceding October 31, commemorating the purported day Martin Luther posted the 95 Theses on the door of the Castle Church in Wittenberg. The liturgical colour is red, celebrating the Holy Spirit's continuing work in renewing the Church. Most Western traditions celebrate All Saints' Day (All Hallow's Day) on November 1 or the Sunday following, with the eve of this feast, All Hallow's Eve being October 31. The liturgical colour is white. The following day, November 2, is All Souls' Day. The period including these days is often referred to as Allhallowtide or Allsaintstide. Saints Days are observed by Lutherans and include the apostles, Virgin Mary and noteworthy figures in the Christian faith. The Confession of St. Peter Week of Prayer for Christian Unity starting on January 18. Conversion of St. Paul ended week of prayer on January 25. Martin Luther King, Jr., renewer of society, martyr January 15 (ELCA only), Presentation of Our Lord and Purification of the Mary Candlemas on February 2. Joseph, Guardian of Jesus St Joseph on March 19, Annunciation March 25, Visitation of Mary on May 31. Lutherans also celebrate St John the Baptist or the Beheading of St John the Baptist on June 24, St Mary Magdalene July 22, St. Mary, Mother of Our Lord or the Assumption of the Blessed Virgin Mary on August 15, Holy Cross Day September 14, Francis of Assisi, renewal of the Church St. Francis of Assisi on October 4, and the Holy Innocents, Martyrs December 28. Lesser Feasts and Commemorations on the Lutheran liturgical calendar include Anthony of Egypt on January 17, Henry, Bishop of Uppsala, martyr Henry of Uppsala on January 19, Timothy, Titus and Silas, missionaries St Timothy, St Titus and St Silas Day on January 26, Ansgar, Bishop of Hamburg, missionary to Denmark and Sweden St Ansgar on February 3, Cyril, monk and Methodius, bishop, missionaries to the Slavs St Cyril and St Methodius on February 14, Gregory the Great on March 12, St Patrick on March 17, Olavus Petri, priest and Laurentius Petri, Bishop of Uppsala, on April 19, St Anselm on April 21, Catherine of Siena on April 29, St Athanasius on May 2, St Monica on May 4, Eric IX of Sweden on May 18, St Boniface on June 5, Basil the Great, Gregory of Nyssa and Gregory of Nazianzus on June 14, Benedict of Nursia on July 11, Birgitta of Sweden on July 23, St Anne, Mother of Mary on July 26, St Dominic on August 8, Augustine of Hippo on August 28, St Cyprian on September 16, Teresa of Avila on October 15, Martin de Porres on November 3, Martin of Tours on November 11, Elizabeth of Hungary on November 17, St Lucy on December 13. There are many other holy days in the Lutheran calendar. Some traditions celebrate St. Michael's Day (Michaelmas) on September 29. Some traditions celebrate St. Martin's Day (Martinmas) on November 11. There are degrees of solemnity of the office of the feast days of saints. In the 13th century, the Roman Rite distinguished three ranks: simple, semidouble and double, with consequent differences in the recitation of the Divine Office or Breviary. The simple feast commenced with the chapter (capitulum) of First Vespers, and ended with None. It had three lessons and took the psalms of Matins from the ferial office; the rest of the office was like the semidouble. The semidouble feast had two Vespers, nine lessons in Matins, and ended with Compline. The antiphons before the psalms were only intoned. In the Mass, the semidouble had always at least three "orationes" or collects. On a double feast the antiphons were sung in their entirety, before and after the psalms, while in Lauds and Vespers there were no suffragia of the saints, and the Mass had only one "oratio" (if no commemoration was prescribed). If ordinary double feasts (referred to also as lesser doubles) occurred with feasts of a higher rank, they could be simplified, except the octave days of some feasts and the feasts of the Doctors of the Church, which were transferred. To the existing distinction between major and ordinary or minor doubles, Pope Clement VIII added two more ranks, those of first-class or second-class doubles. Some of these two classes were kept with octaves. This was still the situation when the 1907 article Ecclesiastical Feasts in the Catholic Encyclopedia was written. In accordance with the rules then in force, feast days of any form of double, if impeded by "occurrence" (falling on the same day) with a feast day of higher class, were transferred to another day. Pope Pius X simplified matters considerably in his 1911 reform of the Roman Breviary. In the case of occurrence the lower-ranking feast day could become a commemoration within the celebration of the higher-ranking one. Until then, ordinary doubles took precedence over most of the semidouble Sundays, resulting in many of the Sunday Masses rarely being said. While retaining the semidouble rite for Sundays, Pius X's reform permitted only the most important feast days to be celebrated on Sunday, although commemorations were still made until Pope John XXIII's reform of 1960. The division into doubles (of various kinds) semidoubles and simples continued until 1955, when Pope Pius XII abolished the rank of semidouble, making all the previous semidoubles simples, and reducing the previous simples to a mere commemoration in the Mass of another feast day or of the feria on which they fell (see General Roman Calendar of Pope Pius XII). Then, in 1960, Pope John XXIII issued the Code of Rubrics, completely ending the ranking of feast days by doubles etc., and replacing it by a ranking, applied not only to feast days but to all liturgical days, as I, II, III, and IV class days. The 1969 revision by Pope Paul VI divided feast days into "solemnities", "feasts" and "memorials", corresponding approximately to Pope John XXIII's I, II and III class feast days. Commemorations were abolished. While some of the memorials are considered obligatory, others are optional, permitting a choice on some days between two or three memorials, or between one or more memorials and the celebration of the feria. On a day to which no obligatory celebration is assigned, the Mass may be of any saint mentioned in the Roman Martyrology for that day. Observed by Roman Catholics and some Anglicans on August 15, which is the same as the Eastern and Orthodox feast of the Dormition, the end of the earthly life of the Virgin Mary and, for some, her bodily Assumption into heaven, is celebrated. The Roman Catholic teaching on this feast was defined as dogma on November 1, 1950 by Pope Pius XII in the Papal Bull, Munificentissimus Deus. In other Anglican and Lutheran traditions, as well as a few others, August 15 is celebrated as St. Mary, Mother of the Lord. Because of the dominance of Christianity in Europe throughout the Middle Ages, many features of the Christian year became incorporated into the secular calendar. Many of its feasts (e.g., Christmas, Mardi Gras, Saint Patrick's Day) remain holidays, and are now celebrated by people of all faiths and none — in some cases worldwide. The secular celebrations bear varying degrees of likeness to the religious feasts from which they derived, often also including elements of ritual from pagan festivals of similar date. ^ "Kalendar". Anglican Catholic Church. 2015. Retrieved May 23, 2015. It is as a result of this connection that "kalendar/calendar" came to refer to the orderly arrangement of time as we now know it, but the established church retained the older "K" spelling to distinguish their kalendar from an ordinary list of events. In other words, a kalendar is simply a church calendar! ^ Stern, Sacha (2001). Calendar and Community: A History of the Jewish Calendar. Oxford University Press. pp. 2–3. ISBN 0-19-827034-8. ^ Talley, Thomas J. (1991). The Origins of the Liturgical Year. Pueblo Publishing Company. pp. 82–83. ISBN 978-0-8146-6075-1. ^ a b c Hickman, Hoyt L. (October 1, 2010). The New Handbook of the Christian Year: Based on the Revised Common Lectionary. Abingdon Press. p. 31. ISBN 9781426730740. ^ Fisher, Jeanne (2015). "The Liturgical Year" (PDF). Third Presbyterian Church. Presbyterian Church (U.S.A.). Retrieved September 29, 2015. The Revised Common Lectionary, used by Presbyterians, Methodists, Episcopalians, Lutherans and some Baptists, is arranged in a three-year cycle. ^ Gregg Strawbridge, "Why the Church Calendar Is Important"
^ "The Sunday which is set down as XXIV after Pentecost is always put in the last place, omitting, if need be, any others for which there happens to be no place" (1960 Code of Rubrics, 18). ^ "All Saints' Tide". Services and Prayers for the Season from All Saints to Candlemas. General Synod of the Church of England. For many twentieth-century Christians the All Saints-tide period is extended to include Remembrance Sunday. In the Calendar and Lectionary we have sought to make it easier to observe this without cutting across a developing lectionary pattern, and we have reprinted the form of service approved ecumenically for use on that day. Wikimedia Commons has media related to Liturgical year. The Roman Catholic Church's liturgical calendar, from US Catholic Bishops, or from O.S.V. publishing. Universalis — A liturgical calendar of the Catholic Church including the Liturgy of the Hours and the Mass readings. Lectionary Central – For the study and use of the traditional Western Eucharistic lectionary (Anglican).